Hello, welcome to Tag It Tuesday! For my tag today I used some shimmery watercolor paints I bought at Michaels, you can't really see the shine in the photo but I was quite impressed. They are the Niji Pearlescent Watercolor Set, very inexpensive, I believe I paid $4.00 with a coupon. I really like the coverage over the kraft cardstock. 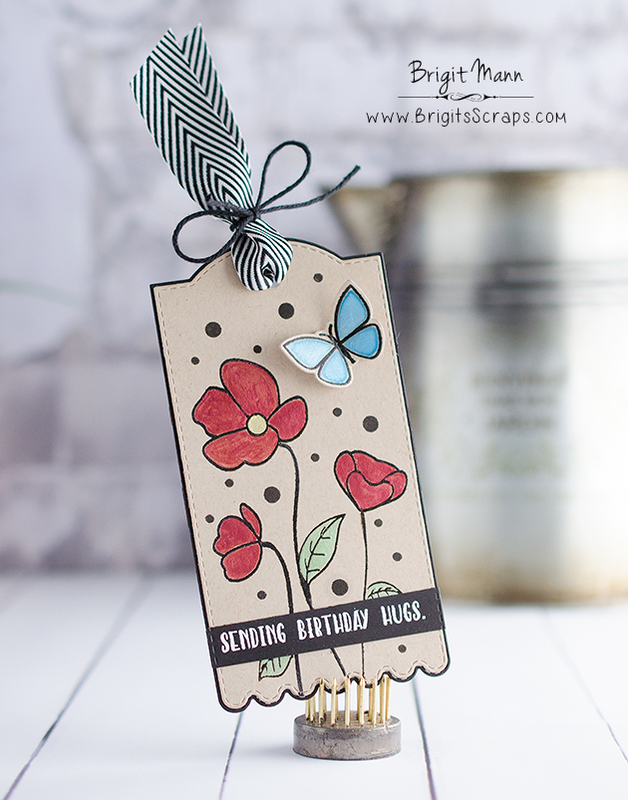 Oh Miss Brigit What a Gorgeous Tag. You so did an Outstanding stamping and coloring job!! Love how you have your butterfly dimensional....your tag is a beautiful work of art....this is a gift within itself.....it turned out Spectacular. in a word WOW!! YOU so ROCK!! You have some really creative ideas. THANKS!!!! Wow! The watercolor covers kraft paper perfectly! Your tag is so pretty...I like the random dots and the leaves. Great job on your tag! Beautiful! I love the brown on black.